Double Hot News from This Very Day (6-24-2014) A hottie Friend know as Michael Lamando owner of Amicis Catered Cuisine in Oldsmar, Florida. So today I ran into Michael who is the only person I allow to call me Bren simply because he is such an awesome friend, business associate and has always supported me personally and is one of the few people in my life who has always apologized as quickly as he realized a mistake was made and that is very very rare today, anyways … I believe that covers all the hottie personal news. Hot Business NEWS is Michael after the past two years of a very rough blow, we all have them but what is important is that we all support each other through any of these rough times!!! Michael is now back in the saddle even more tenacious that EVER and is expanding his business and is getting ready to open a new location at 205 Marlborough Street in Beautiful Oldsmar, Florida. WHAT??? 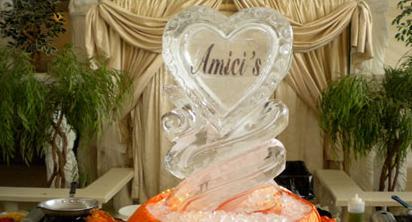 You have never heard of Amicis Catered Cuisine or Michael, shut the front door this cannot be true. Florida State Graduate with degree in hotel and restaurant management, Irish and Italian blood line Amicis is built on Michaels own personal ethics which is stellar! In 1983 Michael opened his business in a 900 sq ft deli then began his catering business which just blew up quickly into one of the Top Five Tampa Bay Catering businesses all of which I am proud to call him friend. Michael catered our wedding plus has catered I know six weddings in the past three years from clients I have sent to him. Every one of the brides still to this day rave about Amicis and in fact one of my girls married then two years later her little sister married and their comment was Ms Brenda we are using your referral. Professionalism, kindness, tenacity, talented staff, conscious, on time service, stay to the last minute, forward thinking and the best staff in the hospitality business. 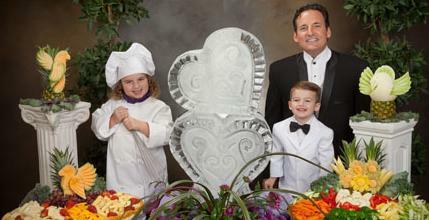 Michael and his staff CAN DO anything from lunch drop offs to elaborate dinners to casual parties to cocktail parties to mixers to themed events to dessert parties to fruit parties and if you want to create something unique My reference would be Michael. IN 2002 Michael catered an Honeymoon Island party for me as one of my Event Auction Items which Quality Thin Films of Oldsmar still talks about today to me! Awards are 2007/2008/2009 Best of Weddings The Knot; 1999/2001/2002/2006/2007 NACE Caterer of the Year; City of Oldsmar Business of year 2000; Florida Aquarium Nauti Night 2001/2002/2006 winner; and more but I want to keep this simply FUN! SHEW … all that to say my hottie Friend and Professional Gourmet Catering company of choice is Michael or Amicis Catered Cuisine. Be watching for his grand opening or ribbon cutting coming soon the Beautiful Oldsmar and you will see me there.